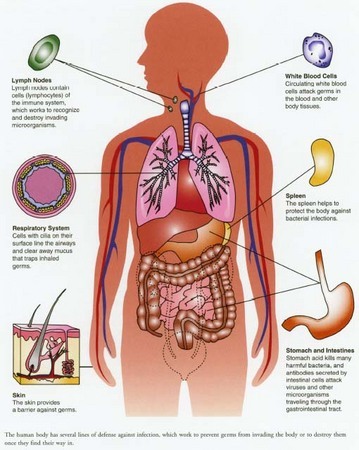 The human body constantly faces attack from foreign invaders that can cause infection and disease. These invaders range from living microbes (MY-krobes), such as bacteria * , fungi * , parasites * , and viruses * , to nonliving toxins, chemicals, and drugs. Fortunately, the body has a number of external and internal safeguards that prevent most dangerous invaders from entering and causing harm. The physical barriers that keep them at bay commonly are referred to as the body's first line of defense. Skin, the largest body organ, provides both a physical and a chemical barrier against the outside world. The skin forms a protective layer that completely wraps around the body, shielding blood vessels, nerves, muscles, organs, and bones. When cuts or tears in the surface of the skin provide an entrance for infective agents, glands beneath the skin produce an enzyme * that helps kill bacteria. Areas of the body not covered with skin do not go unprotected. Mucous membranes, the moist linings of the respiratory system, produce mucus (MYOO-kus), a sticky substance that traps irritants that enter through the nose. Structures like tiny hairs, called cilia (SIH-lee-uh), line the body's airways and constantly wave foreign particles and mucus away from the lungs to where they can be swallowed safely. Most harmful microbes that make it to the stomach are destroyed by stomach acids. In addition, tears and saliva both contain enzymes that destroy invaders. Another important defense mechanism is the brain-blood barrier, a specialized "filter" that surrounds the brain and spinal cord and acts as a physical barrier to keep out proteins, toxins, and most microbes, while letting in glucose, the source of the brain's nutrients. * viruses (VY-ruh-sez) are tiny infectious agents that can cause infectious diseases. A virus can only reproduce within the cells it infects. A second line of defense is housed within the body: a finely tuned immune system that recognizes and destroys foreign substances and organisms that enter the body. The immune system can distinguish between the body's own tissues and outside substances called antigens * . This allows cells of the immune army to identify and destroy only those enemy antigens. The ability to identify an antigen also permits the immune system to "remember" antigens the body has been exposed to in the past, so that the body can mount a better and faster immune response the next time any of these antigens appear. Lymphocytes (LIM-fo-sites), white blood cells that develop in bone marrow * and circulate throughout the body in the lymphatic system * , are a vital part of the immune system. Lymphocytes can be divided into two subgroups: B lymphocytes and T lymphocytes. B lymphocytes (or B cells) produce immunoglobulins (ih-myoo-no-GLAH-byoo-lins), also called antibodies (AN-tih-bah-deez). These protein molecules attach themselves to specific antigens and work with another type of white blood cell, called phagocytes (FAH-go-sites)—scavenger cells that surround and digest infected cells or microorganisms—to destroy the invaders. T lymphocytes (or T cells) help control the immune response and destroy foreign antigens directly. The activity of B cells and T cells targets specific antigens. This means that each time a new kind of antigen invades the body, the immune system must produce a new round of B cells and T cells, which attack only that antigen. It is estimated that the immune system can create more than 100 million types of antibodies. As B cells and T cells mature, they begin to recognize which tissues belong in the body and which do not. These cells become "memory" cells that remember a particular antigen, so that the next time it appears, the immune response can mobilize quickly. In some cases, people have permanent immunity * to a disease; for example, people who contract chicken pox usually will not have it again—or, if they do, they will have a much more mild case. The immune system works with amazing complexity. When a B cell encounters a foreign invader, it starts to produce immunoglobulins, or antibodies. Like a key designed to fit only a specific lock, an antibody "locks" onto a single type of antigen like an identifying marker. Once the antibody attaches to an antigen, one class of T cells called helper T cells alerts other white blood cells to head toward the site, while another class called killer T cells begins to destroy the antigen marked by the antibody. At the same time, millions of antibodies swarm through the bloodstream to attach to any more of that type of antigen and mount a larger attack. The immune system also includes other proteins and chemicals that assist antibodies and T cells in their work. Among them are chemicals that alert phagocytes to the site of the infection. The complement system, a group of proteins that normally float freely in the blood, move toward infections, where they combine to help destroy microorganisms and foreign particles. They do this by changing the surface of bacteria or other microorganisms, causing them to die. * antigens (AN-tih-jens) are substances that are recognized as a threat by the body's immune system, which triggers the formation of specific antibodies against the substance. The human body has several lines of defense against infection, which work to prevent germs from invading the body or to destroy them once they find their way in. from their mothers, both during pregnancy (across the mother's placenta * ) and after birth from breast milk. These antibodies usually disappear within 6 to 12 months, but until then they help protect the infant against a range of infections, including pneumonia * , bronchitis * , influenza * , and ear infection. Doctors also can give people gamma globulin (GAH-muh GLAH-byoo-lin), an antibody preparation that offers temporary immunity to patients who might need this protection. When a person gets an immunization, or vaccine * , the body's immune system learns to recognize that particular bacteria or virus. If, sometime later, the person is exposed to the germ again, the body can fight it off and not come down with the disease. Along with physical barriers and the immune system, the body has several other mechanisms that fight antigens. Coughing or sneezing is an automatic reflex that can rid the body of irritants. Interferon (in-ter-FEER-on), a naturally occurring substance in the body that fights infection or tumors, is produced automatically when the immune system is called into action. The inflammatory response, or inflammation (in-flah-MAY-shun), is an important body response to injury. When bacteria, toxins, burns, or other culprits damage tissue, the injured tissues leak chemicals, including histamine * and other substances. This chemical cocktail causes blood vessels around the damaged area to leak fluid into the injured tissues and make them swell. The increased flow of blood and fluid to the area also brings phagocytes and other infection-fighting cells to take care of any toxins or other antigens in the area. Pus, which is a fluid containing dead body cells and tissue, dead bacteria, dead toxins, and dead and living phagocytes, sometimes forms at the site of inflammation. To the eye, inflamed skin may appear red and swollen, and the area may feel slightly warm to the touch. Ancient physicians used the Latin terms "dolor," "rubor," "calor," and "tumor" to refer, respectively, to pain, redness, heat, and swelling, the hallmarks of inflammation. Inflammation also may cause a fever. The increase in body heat can help kill bacteria or viruses at the site of the infection. Strong and healthy immune systems successfully ward off many diseases, particularly infections, but weakened immune responses can permit various diseases to develop. Age can influence the immune system's effectiveness. Newborns and the elderly may have a weak or impaired immune response to antigens. Newborns' immune systems are not fully developed at birth but typically become stronger during the first year of life. To strengthen their immune response, newborns can benefit from breastfeeding. * placenta (pluh-SEN-ta) is an organ that provides nutrients and oxygen to a developing baby; it is located within the womb during pregnancy. * bronchitis (brong-KYE-tis) is a disease that involves inflammation of the larger airways in the respiratory tract, which can result from infection or other causes. * histamine (HIS-tuh-meen) is a substance released by the body during inflammation. It causes blood vessels to expand and makes it easier for fluid and other substances to pass through vessel walls. Immune systems that work but react incorrectly to the antigens within a person's body can lead to a number of immunological (ih-myoo-no-LAH-jih-kul) disorders. These are called autoimmune (awtoh-ih-MYOON) diseases. In autoimmune diseases, the body cannot distinguish between itself and foreign particles and may turn its disease-fighting powers on its own tissues, blood, and organs. Although no specific cause for this imbalance has been uncovered, hormones * may be involved. Gender factors into who might experience an autoimmune disease. According to the American Autoimmune Related Diseases Association, of the more than 80 chronic autoimmune diseases, about 75 percent of cases occur in women, and women appear to be most vulnerable to these diseases during their childbearing years, when the levels of hormones are highest in their bodies. Heredity seems to play a part as well. A person may inherit the tendency to have an autoimmune disorder but might not have the same disease a close relative has. For example, a grandmother may have rheumatoid arthritis * , and the granddaughter may have lupus * . These conditions are related in many ways, but they are different diseases. Some common medical conditions can put people at increased risk for infections. People with diabetes * are especially prone to infection, in part because high levels of sugar in the blood can interfere with the functions of certain white blood cells. Patients with chronic lung disease are often at a high risk for pneumonia and bronchitis. Urinary tract infections tend to occur more frequently among people born with abnormal urinary tracts or those who experience an obstruction, such as a kidney stone * . People with certain types of heart disease, particularly of the heart valves, are more likely to have endocarditis (en-do-kar-DYE-tis), an inflammation of the inner lining of the heart (called the endocardium, endoh-KAR-dee-um), after dental procedures or surgery. Chronic malnutrition that causes a protein deficiency in the body also can lead to immune problems, because immunoglobulins and other parts of the immune system are made up largely of proteins. Chronic diseases can wear down the immune system and make people more susceptible to infection. An immune system that is weakened in this way is said to be compromised. Sickle-cell anemia * , for instance, causes damage to the spleen * . Because the spleen helps protect against bacterial infections, this leaves the body more vulnerable to infections, such as those involving the lungs, bone, and blood. As human immunodeficiency virus (HYOO-mun ih-myoo-no-dih-FIH-shen-see) (HIV) infection damages and weakens the immune system, many kinds of infectious diseases that take advantage of a poor immune response can appear. In many cases, prompt diagnosis of such "opportunistic" infections and treatment with combinations of antiviral drugs have been able to slow this process. * hormones are chemical substances that are produced by various glands and sent into the bloodstream carrying messages that have certain effects on other parts of the body. * rheumatoid arthritis (ROO-mah-toyd ar-THRY-tis) is a chronic disease characterized by painful swelling, stiffness, and deformity of the joints. * lupus (LOO-pus) is a chronic, or long-lasting, disease that causes inflammation of connective tissue. the material that holds together the various structures of the body. * kidney stone is a hard structure that forms in the urinary tract. This structure is composed of crystallized chemicals that have separated from the urine, It can obstruct the flow of urine and cause tissue damage and pain as the body attempts to pass the stone through the urinary tract and out of the body. * sickle-cell anemia, also called sickle-cell disease, is a hereditary condition in which the red blood cells, which are usually round, take on an abnormal crescent shape and have a decreased ability to carry oxygen throughout the body. In severe combined immunodeficiency, a person's ability to fight infections is severely impaired. 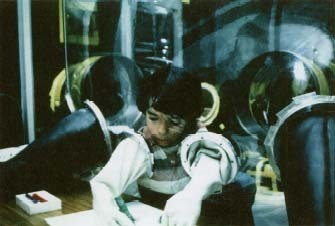 This condition has been dubbed "bubble boy disease" and became widely known during the 1970s with the case of David Vetter, who lived for 12 years sealed in a plastic, germfree environment. of drugs that destroy cancer cells, often kill the beneficial white blood cells in the bone marrow as well. Patients who have organ transplants are given high dosages of drugs called corticosteroids (kor-tih-ko-STIR-oyds) to suppress their immune systems and try to keep their bodies from rejecting the transplanted tissue, which typically is recognized as "foreign." Severe combined immune deficiency syndrome, in which an infant is born with a significant lack of both B cells and T cells, often leads to serious immunity problems; it occurs in one in a million births. During the first 3 months of life, babies with this condition can experience life-threatening infections and diseases, particularly sepsis * , pneumonia, and meningitis * . Common childhood diseases, such as chicken pox, can easily overwhelm these patients' immune systems. Chronic granulomatous (gran-yoo-LO-muh-tus) disease occurs in males when the body's phagocytes are ineffective against certain bacteria and fungi. Patients develop recurrent and unusual skin, lymph node * , and other infections. Repeated infections can lead to granulomas (gran-yoo-LO-muhs), masses that develop in the skin, lungs, liver * , lymph nodes, and bones. They can be slow to heal and drain. Numerous other influences can affect the health of the immune system as well. In societies where smoking is acceptable, for example, people are more at risk for lung cancer and respiratory ailments, both of which can lead to various secondary infections, including bronchitis. Second-hand smoke, or passive smoking, increases respiratory infections for both infants and children. Children who are exposed to second-hand smoke may be predisposed to pneumonia, allergies * , and asthma * as well as repeated irritations of the eyes, nose, and mouth. Nutrition, too, has an impact on the immune system. Malnutrition, with diets deficient in a variety of nutrients, such as certain vitamins, minerals, or protein, can cause increased vulnerability to infection. * allergies are immune system-related sensitivities to certain substances, for example, cat dander or the pollen of certain plants, that cause various reactions, such as sneezing, runny nose, wheezing, or swollen, itchy patches on the skin, called hives. * asthma (AZ-mah) is a condition in which the airways of the lungs repeatedly become narrowed and inflamed, causing breathing difficulty. American Autoimmune Related Diseases Association, 22100 Gratiot Avenue, E. Detroit, MI 48021. The American Autoimmune Related Diseases Association offers information on many autoimmune diseases. Genetic Alliance, 4301 Connecticut Avenue NW, Suite 404, Washington, D.C., 20008. The Genetic Alliance offers information about genetic diseases, including autoimmune disorders, and links to support groups. KidsHealth.org . KidsHealth is a website created by the medical experts of the Nemours Foundation and is devoted to issues of children's health. It contains articles on a variety of health topics, including information about the immune system and related topics, such as urinary tract infections, bronchitis, immunization, lupus, the spleen and lymphatic system, fungal infections, diabetes, genetic disorders, and many others.